In its weekly report issued on July 31, the U.S. Drought Monitor reported that 82 percent of the state of California was in an extreme drought and 58 percent was in exceptional drought—up from 79 and 36 percent just two weeks ago. 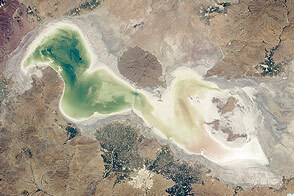 The drying of farmlands and suburbs is mirrored by the shrinking of the state’s reservoirs. 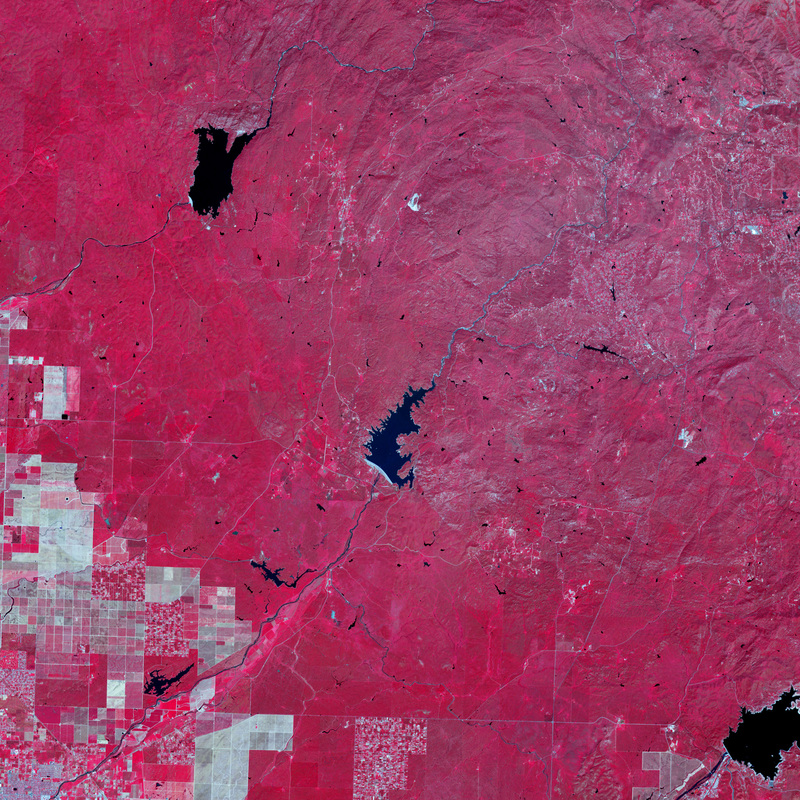 The Advanced Spaceborne Thermal Emission and Reflection Radiometer (ASTER) instrument on NASA’s Terra spacecraft captured these false-color views of central California on April 5, 2011 (top), and May 15, 2014. 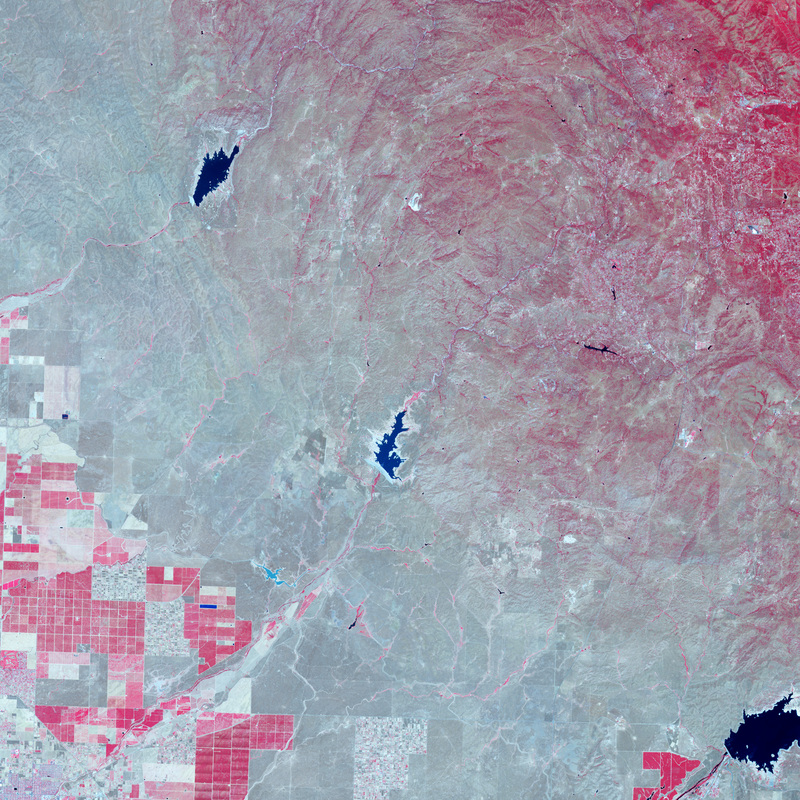 ASTER collects data in infrared, red, and green wavelengths of light, which are then combined to make false-color images where vegetation appears red; buildings and roads are white and gray; water is dark blue; and dry, barren land is tan. 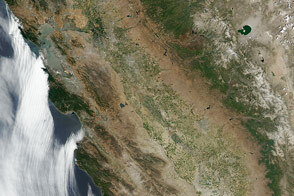 The images show an area north of Fresno, California, between the San Joaquin Valley and Yosemite National Park. The scene includes two reservoirs—H.V. Eastman Lake and Hensley Lake—that were built for flood control, irrigation, and recreation in the 1970s by the U.S. Army Corps of Engineers. Eastman was formed behind a dam across the Chowchilla River, and Hensley grew behind an earthen dam on the Fresno River. 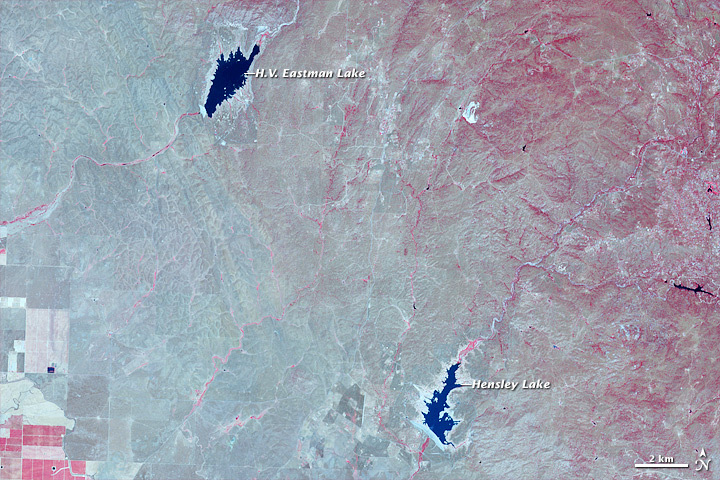 At the time of the 2011 image, the landscape was comparatively lush with vegetation (which appears red) and the lakes were robust. After three years of drought, the 2014 scene shows a browned landscape and lakes that have shrunken considerably. 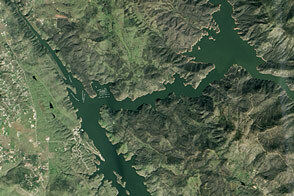 In the lower left corner, farmland does not appear to have changed much. 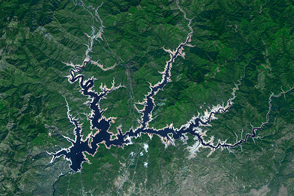 In fact, some areas look like they have more vegetation in 2014, though that could be because the 2011 image was taken earlier in the spring. Turn on the image-comparison tool to see the differences. 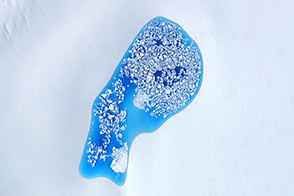 As of July 31, 2014, H.V. 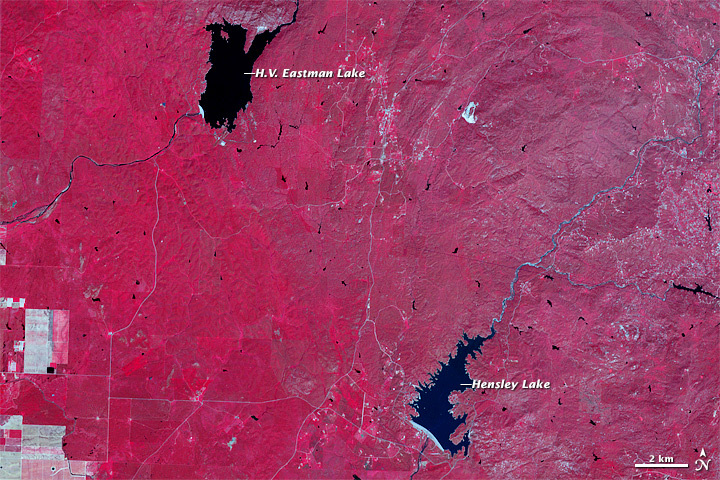 Eastman Lake stood at 8 percent of water capacity and Hensley stood at 6 percent, according to the California Department of Water Resources. For more images from the California drought, please visit our event gallery. 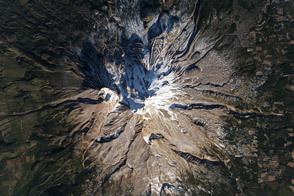 NASA Earth Observatory image by Jesse Allen, using data from NASA/GSFC/METI/ERSDAC/JAROS, and U.S./Japan ASTER Science Team. Caption by Michael Carlowicz. 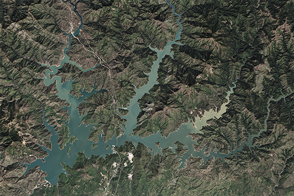 Two reservoirs in the foothills of the Sierra Nevada show the effects of long-term drought. 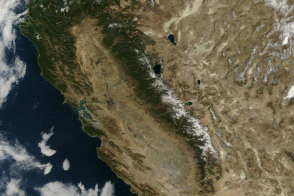 Drought plagued California and much of the American Southwest for nearly five years before extensive rain and snow brought relief in 2016-17. 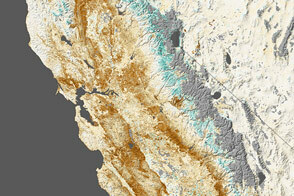 NASA Earth Observatory (2014, July 18) The Golden-Brown State. SFGate.com (2014, July 16) Plenty of water to enjoy at McArthur-Burney Falls. Accessed August 1, 2014. U.S. Army Corps of Engineers, Sacramento District (2014) Eastman Lake. Accessed August 1, 2014. U.S. Army Corps of Engineers, Sacramento District (2014) Hensley Lake. Accessed August 1, 2014.